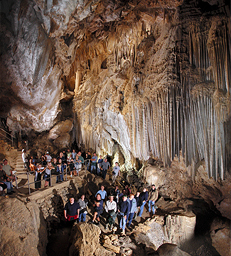 The Lake Shasta Caverns is a system of caves made of limestone positioned near the McCloud arm of Shasta Lake. It is said to be at least 200 million years old and was formed by flowing water that later drained and left the astonishing caverns we now see. Today, there are eight known rooms in the cavern system open for the public to view. Until 1962 when it became open to the public, only tough spelunkers were able to view the caverns from the inside by expertly winding their way through narrow openings and crevices. Then, in 1962, they decided to open it up for public viewing and in the process of using explosives to create a larger entrance, they accidently knocked down a wall revealing what is now referred to as the Discovery Room, arguably the most captivating room in the caverns. The Basement Room, after this mishap explosion, is ironically no longer the lowest room. Thousands of visitors each year come to catch a glimpse of one of Northern California’s greatest treasures. For more information on tours please visit the official website at http://lakeshastacaverns.com/.